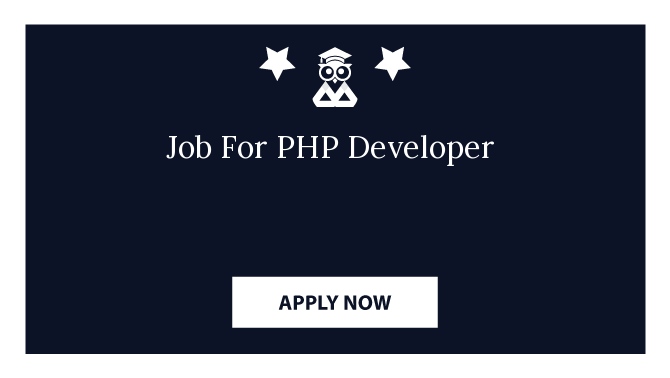 ->Knowldge and Work Experience like Core PHP, Codeignitor, Laravel, E-commerce, Opencart, etc. ->Sound knowledge of database designing and application architecture planning for Core PHP projects. To apply for this job position please use the form below. Company - What are the T & C to start the work on our recruitment profile? Call 7487923934 for more details. Company - Do you take any charges from candidate? No, we don't charge anything from candidates and nor work with companies that charge candidates after joining. So this is our clear policy to that neither we charge and nor the companies we work with can charge the candidates. In Job Application Form - What is Preferred Industry, Preferred Location & Job Type? How do i know wheather the job openings you have are relavent to my profile or not? If i dont have a resume, what shall i do? How to apply on your website? To make your cv/resume, you can go to the link --> https://spotinjob.com/cv-maker and once resume/cv is created just upload the details to https://spotinjob.com/upload-cv and we will be back with the relevant positions. Best consultancy ever! If you haven't approached it till now then just ask them. Thank you for getting me a good job and good company, doing excellent work to consult for a job who need and with great and true communication with proper way. They help to find a new job and change the job of there needs. Doing the best work guys. Best job consultancy for get a good job of your choice. Best and free consultancy services and provided the best job. I got job instant by them. Thanks spot in job. They provide me with the best staff. Fast and superb services with a proper guidance and location. Excellent service and quick response we really appreciate and one of the best consultancy free for placement. Thank you so much spot In Job. Excellent service and quick response. Best consultancy...very helpful and professional as well courteous, helped me in finding the right employer as per my profile. Thank you spot in job. Very professional... They never get tired until they find the right employer as per your requirements... Must recommend!!! It was a great working experience with owner Ishan shah and trupesh bhai. We are expecting same service in the future. Best placement consultancy for getting a good job of your choice. Candidates you share with us it's really very nice and almost all our opening is full fill with your consultancy. Nice to work with you guys. SpotIn has been very helpful for us to identify highly talented and skilled professional for a technology centric company like Tark Technologies. We are very choosy employers and with their help, we always get the talent we really wanted. Why 5 star? 1. Focus on detailing. 2. Completely synced with company and candidates. 3. Scheduled with synced timings. 4. All information give with phone and mail. Give fully involvement before schedule and after schedule. Taken full review from both the sides after scheduled completed. 5. Make some flexibility both the sides on the timings, arrangements and better services. They are honored for the better appreciation. Quick service and a free of cost consultancy. Highly recommended. I am impressed with Spot In Job Consultancy free placement service. They have put me through job quickly when i was quickly looking for a job. My current job is of Hr Administrator at Rajkot Location. Its been amazing time over spot in job consultancy being hr recruiter and i truely rate this place of work with 5 *****. Highly recommended for Job Recruitment & Staffing Solutions. 5 Star Job Recruitment Service. Our site stores a variety of data to provide relevant job openings. Also our site is protected by copyright laws. COPYRIGHT © 2013 - 2019 SPOT IN JOB CONSULTANCY. ALL RIGHTS RESERVED.